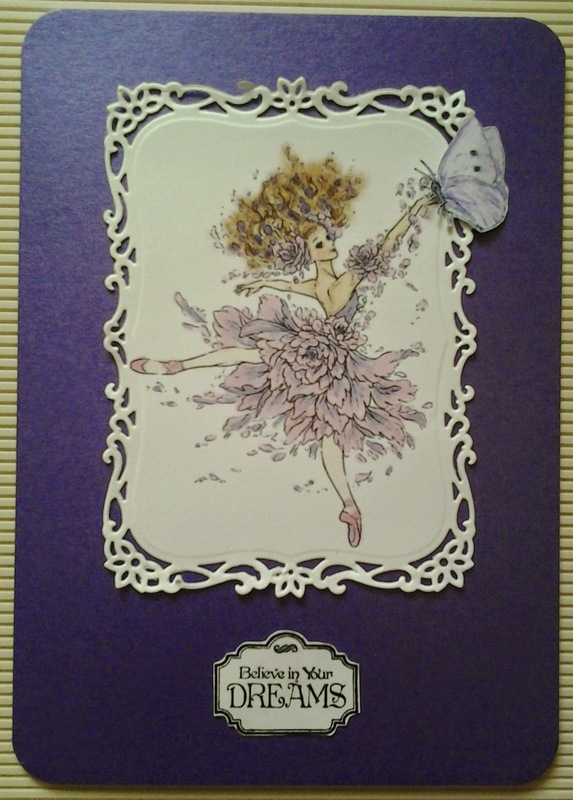 One of the lovely stamps by Aurora Wings called Flower Ballerina. I coloured her with copic pens and cut the topper using a Spellbinders die. I glued the topper to a purple card and added a stamped sentiment. I cut a butterfly from some backing paper to finish the card. Oh my, Sue, your ballerina makes me think of magical creatures dancing in the garden, especially with that wonderful butterfly perched on her hand. Beautiful work! I love the soft, feminine colours and the lovely die-cut lace-work around your focal piece. The image is stunning but much of that is due to your amazing job of colouring. I love that you have the butterfly cut out and seemingly landed on the card. Thanks so much for joining our Watercooler Wednesday Challenge this week. Love this ballerina dancing with a butterfly. She looks like she is ready to leap right off the card! Thanks for joining us at Watercooler Wednesday.